We believe that by and large, people are over-medicated and assigned a mental diagnosis that conveys a belief that something is permanently wrong with them. To our mind, there is a lot more involved in mental health and addiction treatment. It’s become apparent that medical issues, hormonal factors, nutritional choices, genetics and psychosocial dynamics are majority components in one’s mental health. After decades of clinical review in human behaviors, science, and the challenges still evident in personal health and the way people handle pain in the physical, emotional and spiritual realms, we realized that the ability to authentically heal requires both holistic and integrative methodologies. Our program focuses on restoring balance to brain chemistry using natural methods, reducing symptoms, the need for medication dependency and other harmful substances. We do this by individual assessment, focusing on every aspect of our clients’ needs, and utilizing the best available treatments providing the most benefit for each person. There’s a reason you’re here, seeking knowledge on the best way to break free from medication use. We applaud your desire to feel good, naturally. Although prescription drugs do have a role in health care, their side effects and risk for dependency or addiction make them less than ideal as a long term solution. You might already know this first hand. 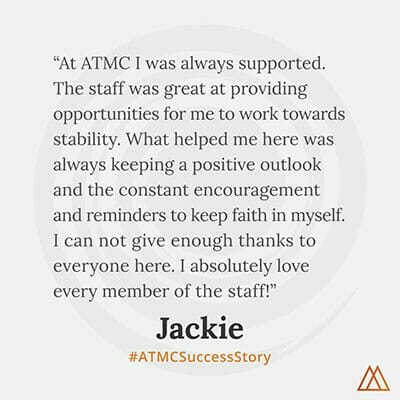 Many of ATMC methods have been scientifically proven to work. We draw from the proven fields of environmental medicine, naturopathy, psychology and more. Through this unique collective approach, we have found that many mood disorders and other imbalances are the result of improper nutrition, toxic overload, mutated genes or damaged enzymes – seldom dealt with at other recovery centers. We know you deserve a fresh perspective for better quality of life. Through careful, monitored medication tapering, counseling and extensive options in alternative therapies, exercise, mindfulness practices, nutrient-rich diet and more, rediscovering your whole self is a welcome experience. It begins with a detailed biochemical examination of where you’re at today, the basis in creating a personalized treatment program. Because only direct physiological treatment will effectively identify the why of drug or alcohol cravings. Read more about our lab assessment process.